I'm Sorry But....No Streaming Over Christmas Break! 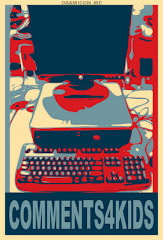 If you have come from Dean Sharski's blog, I apologize for the class stream being down. I simply couldn't justify the use of electricity for two weeks for streaming a room with nothing going on. I promise that the stream will be back up January 5 (weather permitting). 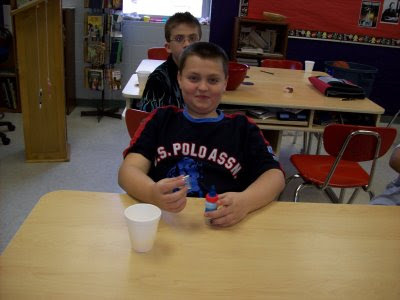 Here are a few snapshots from our last day of school in 2008. The first is a picture of our student council with the canned food they collected from the annual food drive. Here is a video I took of one of the sixth grade classes "caroling". It pays to have a pocket video camera handy! 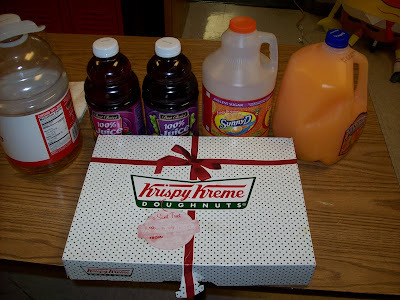 This picture shows what we had for our annual fifth grade breakfast. Muffins, Krispy Kreme donutes, and various juices were on the menu. Gavin is enjoying candy I gave to the students for Christmas. 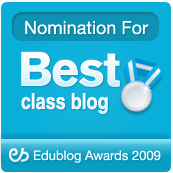 Teachers are trying to get the grades in the online gradebook. The end of the semester is almost nigh! 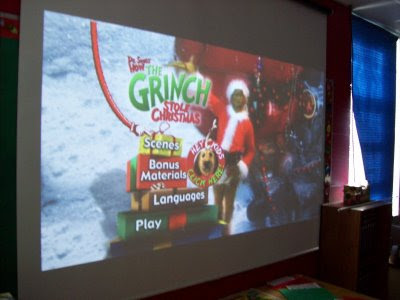 Traditional Christmas stories for the students to enjoy. Can you compare the movie to the original Dr. Seuss story? 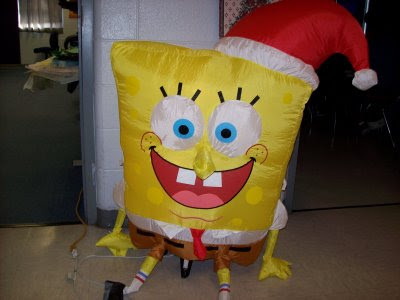 Spongebob Christmaspants wishes the students Happy Hollidays! Here the students are creating snowflakes. Every snowflake they create is different, just like the snowflakes we find floating through the skies. 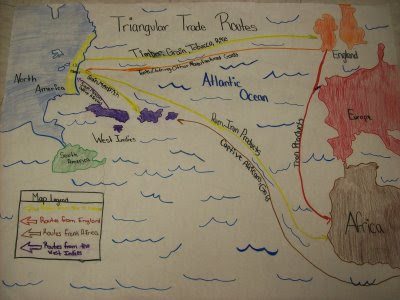 Here is Alec explaining the Triangular Trade Route. This was an important way for people to import and export during the United States colonial period. 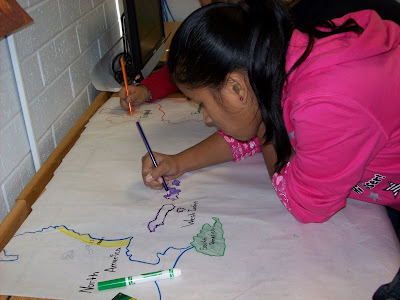 Here are some pictures of students working on their poster projects. Thank You Mr. Webb and Tamaki Today! 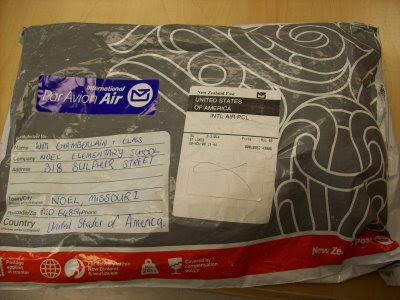 A package came today from New Zealand. A package that I have been waiting for. Mr. Webb from Tamaki Today had sent me a message saying he had sent a thank you package for our work on one of his video projects. As the students looked on, I slowly took out the items that had been sent. First was a stuffed kiwi. Next, two magnets, one that showed a picture of a kiwi. Then I pulled out a very neat lanyard (which I am now wearing). I then pulled out a huge textile map that had the country of New Zealand with some interesting information on it. At the bottom of the package was a paper weight that has New Zealand etched in it. The last thing I pulled out was a card from Mr. Webb thanking the class for our support. As soon as my students had time, they were up and looking (rather loudly) at the items. They really enjoyed the map. The information on it was very interesting to them. One of my students noticed there were opossums in New Zealand and he asked me if they were the same kind that we have. Obviously, they will be looking that up when they have a few minutes. They also thought it was neat that there are penguins on the map. We have to go to a zoo to see penguins! Finally, the students started asking me if we were goinng to send some items back to Mr. Webb. I told them I was planning on it, but the problem with that is the Tamaki school will be out for their "summer break" next week. Now, we have already studied about the seasons and their relationship to the tilt of the Earth. They knew that when we had winter, they southern hemisphere was having summer, but they didn't internalize it. 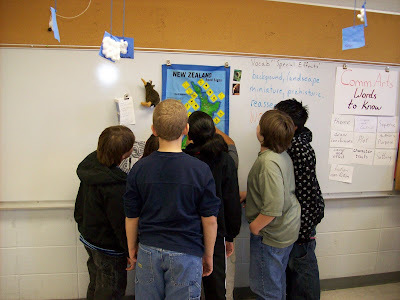 The light bulb of understanding shone as they began to really realize that it soon will be summer in New Zealand. 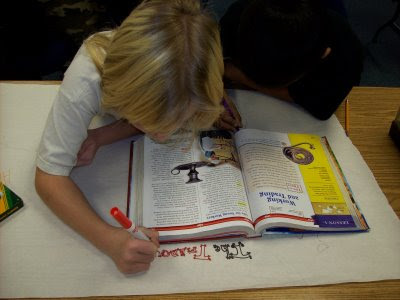 My point is this: Learning takes place when learning is meaningful! Can the power of negative thinking really cause someone to shrink? My class decided to imagine Gavin getting shorter. Before we went to PE I marked his height on the door jam with a permanent marker. The class concentrated on him shrinking the entire time they were at PE and when we came back, Gavin stood against the door jam again. As you can see it looks like he shrunk an inch! We (really me) felt bad about his losing so much height. 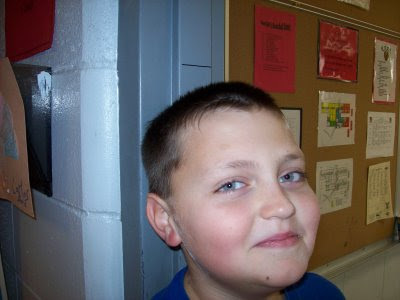 This was a bad time for him to get shorter, with basketball tryouts going on. I decided we needed to think positive and imagine Gavin getting taller. We will measure him again tomorrow and see if our positive thinking worked. Here are some winterscapes created by my class. Using both cut paper for the landscape and white tempera paint for the snowflakes give the picture the impression of dimension. (When cut paper pictures are made digital, it also adds depth.) I am trying to bring more art and music to my blog; comment if you would like to see (or hear) more. 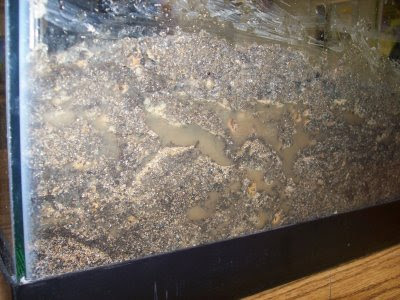 For the first experiment on weathering and eroding we took a look at what kind of erosion can take place when water runs off the Earth's surface. To record the video I set up a tripod above the glass aquarium to get a good top-down view of the action. I placed my web cam on the tripod connected to my laptop. I streamed the video from my laptop to Ustream. When I was ready to do the investigate, I hit the record button on Ustream to record it. Because of of the size of the aquarium, I used a 2 gallon bucket of water to simulate water run-off. I used my digital camera to take pictures to record what the web cam could not. Here is a picture from the top down taken before I poured the water on the model. 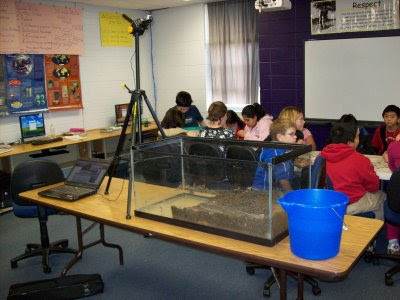 The soil was created using four substances: humus, sand, gravel, and clay. I added water to make the soil more realistic. The water I mixed in also helped keep all the water I poured on the model from being absorbed into the soil. Although you may not be able to see from this angle, I also slightly sloped the soil so the water would be able to run-off. Here is the video of the water being poured on the soil. Notice the path the water takes. 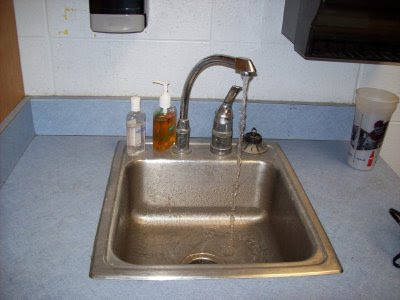 When the water is done moving, can you tell where the water was? Here is a top down view. Compare it to the original picture taken before the water was poured onto the model. Can you see a difference? How is it different? This is a side view of the model. Notice the water under the surface of the soil. How did that water get there? What is that water called? Do you think the water stayed there, or did it move later? 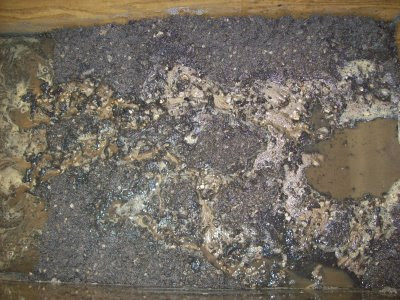 Here is a picture of the bottom of the model where the soil ended. Describe what you see. How is it different than before the water ran over it? In the top part of the picture is where the water ran off. Why is it so dirty? 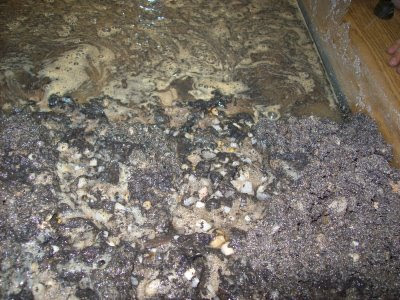 What do you think is in the water that makes it so dirty? Does this help illustrate the watershed concept? 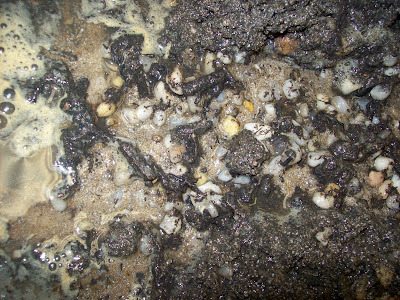 This is a close-up picture of the soil after the water ran off it. What do you see? Is the soil still mixed up or has it separated? 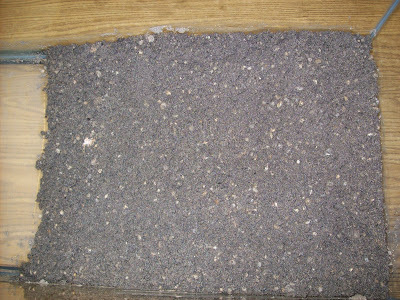 Does this look like a stream bed? Now that the experiment has been completed, what could we change to create a new experiment? Does this model help you with the part of the water cycle that takes place on the surface of the Earth? My students posted on the Compendium on the topic "What can I do to conserve water?" This is a wordle created from their posts. 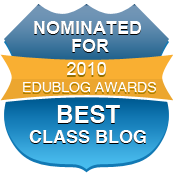 A wordle is a word cloud created using words from a blog, a post, or any text entered. The more often a word is used, the larger the word appears. This is an excellent way to examine your writing. What words do you think the students emphasized the most? Whenever there is an opportunity to combine two of our disciplines together, the fifth grade teachers jump at the chance. 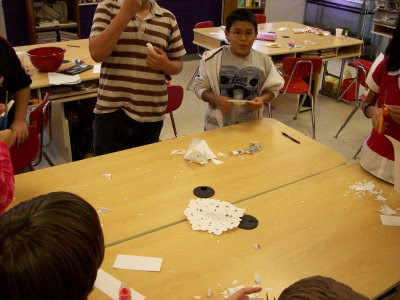 While art is easily combined with both science and social studies, it is often harder to integrate into math. Here is an excellent activity that can be used to tie the two together. Each picture is created by polygons. The student identifies the correct polygon, then they use the polygons to create a piece of art. I believe that they could be considered part of the Dada movement. What art movement would you consider these pieces to be part of? Water Conservation: What can I do to conserve water? After a few days of discussion and watching a good video from Missouri Botanical Gardens, "The Case of the Mysterious Neighbor", I asked you to create a list of ways you could help conserve water. From your list pick the three best and post them on the Compendium with an explanation for each one. 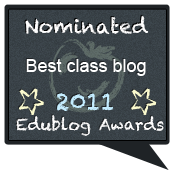 I am so pleased that TamakiToday was picked to be a finalist in the Best Use of Video/Visual category for the Edublog Awards! 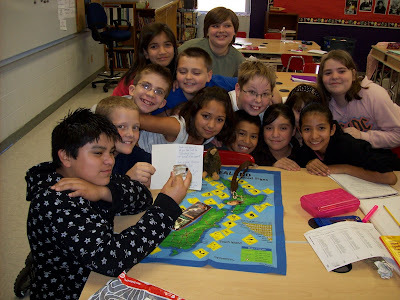 Click this link to vote for Tamaki Intermediate School! 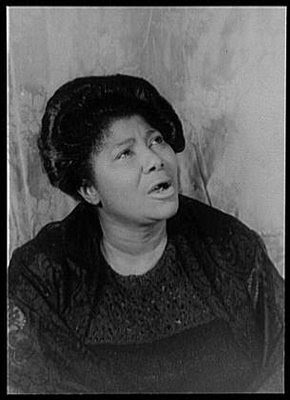 Our story in reading this week is about Mahalia Jackson and the music genre known as the blues. If you would like to listen to some of Ms. Jackson's singing and some other gospel and blues music go to Pandora.com and create a station with the name Mahalia Jackson.